VW brand's I.D. family of full-electric cars will roll out in 2020, starting with the I.D. hatchback (left). BERLIN -- Volkswagen may have to step up its plans for mass production of electric vehicles in order to meet tougher-than-expected European targets to cut greenhouse emissions from cars, CEO Herbert Diess said. The remarks came after the European Union agreed on Monday to cut CO2 emissions from cars by 37.5 percent by 2030, and follow warnings from Germany, home to the bloc's biggest automotive industry, that tough targets could cost jobs and harm the sector. This is more than the 30 percent VW, still reeling from an emissions cheating scandal, expected and would translate into a share for electric vehicles of more than 40 percent of its expected total vehicle sales in 2030, CEO Herbert Diess said. "This means that our planned restructuring program, which is needed to address this systemic change, is not yet sufficient." German Economy Minister Peter Altmaier said the targets were at the limit of what was technically and economically feasible. Around 436,000 industrial jobs in Germany are tied to building petrol and diesel engined vehicles. "This is a tough stretch and is at the higher end of expectations – however, we are convinced that this will help the industry to finally accept that combustion engines and platforms need to be standardized," Evercore ISI analysts wrote. VW has earmarked about 30 billion euros ($34 billion) for the next five years to make sure it can achieve CO2 cuts of 30 percent by retooling its production process to focus more on electric vehicles. The tougher EU targets, Diess said in e-mailed remarks, would require further changes to its strategy. "Restructuring our product portfolio, possibly further reducing our combustion engine-based offering and a significant adjustment of our plant structures and additional battery cell and battery factories would be necessary," Diess said. He said VW's plans needed to be reviewed in autumn 2019, in line with the carmaker's planning calendar. 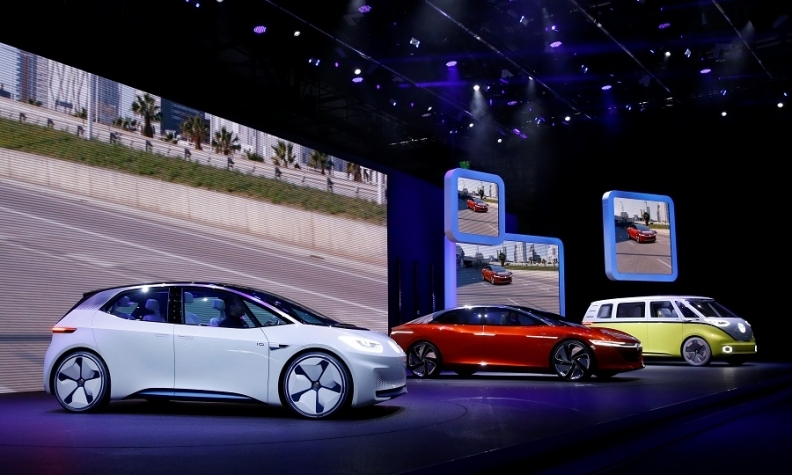 Overall, VW plans to spend almost 44 billion euros on developing electric cars, autonomous driving and new mobility services by 2023, aiming to become the most profitable manufacturer of battery-powered vehicles. German rivals BMW and Daimler declined to comment on the EU targets, referring instead to statements from industry groups. German car association VDA said the targets were too high and criticized the lack of a clear roadmap for how the reductions would be reached.